Fig. 1—“Lyin’ Mike” Michael E. Horowitz, Inspector General of the U.S. Justice Department, promised the American people in his Confirmation Hearing that he would tell the truth and avoid even the appearance of impropriety in a sworn statement. Click here for a powerful summary by a world-class expert at the Anonymous Patriots, American Intelligence Media. Some of these insidious programs have been active since the C.I.A. 's founding in 1947. Whenever news of the existence of these programs leaks into the mainstream media, the rogue C.I.A. hive marginalizes it by calling it "conspiracy theories" using all the MSM talking heads. Readers should know that it was President Johnson and the same rogue C.I.A. who had President John F. Kennedy killed. 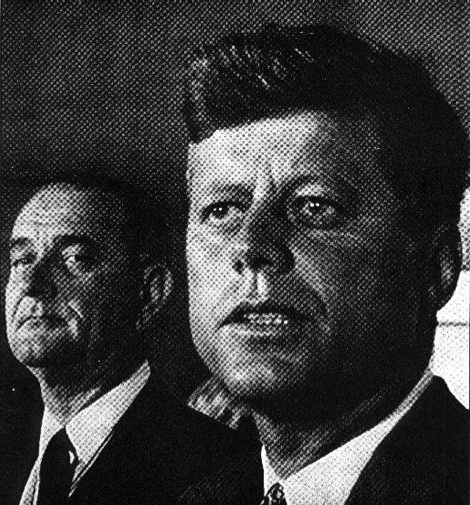 JFK had stated to aides that he that he wanted to "splinter the C.I.A. into a thousand pieces and scatter it to the winds." The C.I.A. invented the label "conspiracy theory" to cover up their involvement. However, that conspiracy trolling seems to be losing its effectiveness, along with their well-researched triggering epithets like "racist, homophobe, misogyny, sexist!" Facts are not theories. This distinction is critical to an awake citizenry, if we are to take back our Republic from these people. (Dec. 17, 2017)—On Dec. 13, 2017, Rod Rosenstein, Deputy Attorney General, testified before the House Judiciary Committee about the evident conflicts of interest within the DOJ/FBI's Trump-Russia investigation. Fig. 2: “Rotten Rod” J. Rosenstein, Deputy Attorney General, testified to the House Judiciary Committee on Dec. 13, 2017 about the evident FBI / DOJ conflicts of interest in the alleged Trump-Russia election interference investigation. This investigation has dragged on for seven months and has produced no evidence of Trump Russian collusion. Fusion GPS, the Democratic political opposition research firm, was recently exposed as the source of the fabricated “dirty dossier.” James B. Comey’s FBI used the fraudulent dossier to get a secret FISA Court authorization to wiretap the Trump campaign. Then, Comey admitted to Congress that he first showed President Trump a summary, then immediately leaked the bogus document to The New York Times with the specific objective of triggering a Special Counsel investigation to embarrass the President. Such conduct in itself is an illegal release of a classified document by Comey. New information shows that senior FBI officials under Comey ordered the fabricated dossier from Fusion GPS to help prevent Donald Trump from being elected President. Rosenstein refused repeatedly to comment when asked direct questions. Instead, he repeated the now hackneyed lawyer scam: “I cannot comment on an ongoing investigation.” We now realize that this deceptive only-for-lawyers rule allows lawyers to scam the public. It gives their crony judge friends the excuse to turn a blind eye to all manner of illegal conduct. Even the William & Mary Law Bill of Rights Law Journal called it "Getting Away With Silence." Rosenstein fidgeted with his notes, looked away, looked down, nervously laughed, smirked, glared, peered at the questioner from the corners of his eyes. Psychologists say these are classic body language signals of deception. See for yourself: C-Span Video. Fig. 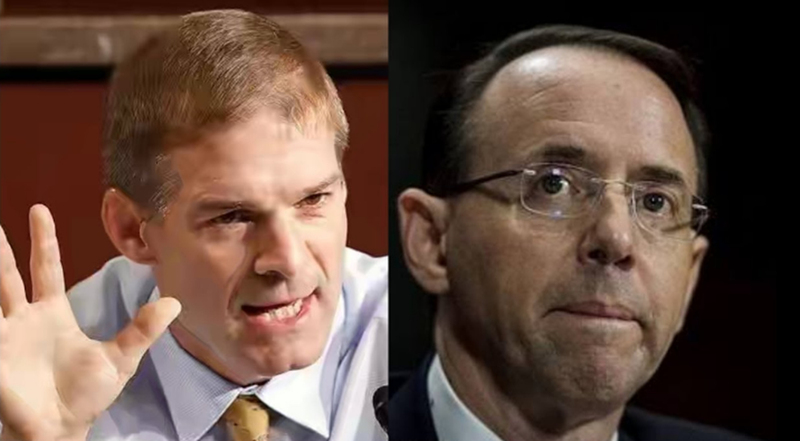 3: Rep. Jim Jordan (OH-4th) blistered Rod J. Rosenstein, Deputy Attorney General, for his uncooperative and evidently deceptive testimony before the House Judiciary Committee on Dec. 13, 2017. Here's the full Video. Here's in a Fox interview with Rep. Jordan following the hearing saying in now appears that the C.I.A. and FBI orchestrated a plan to prevent Donald Trump from being elected as President. The official line from Mueller's office was that following the revelation of these anti-Trump texts, Mueller removed Strzok from the investigation, reassigned him to human resources, and sent Page packing to the Securities and Exchange Commission. Political observers don't believe Mueller's stated reason since it is well known that all, or practically all, of Mueller's team were anti-Trump. If he used that logic consistently for all his employees, he'd fire most of his staff, as Congressman Jordan wryly pointed out. So, that cannot be the real reason. Remarkably, one of Horowitz's letters of recommendation in his confirmation was from David W. Ogden (24.1 MB), Assistant Attorney General. Ogden was also a close DOJ colleague to Robert S. Mueller, James B. Comey, Eric J. Holder, Jr., James P. Chandler, III,, Rod J. Rosenstein and Andrew Weismann. Fig. 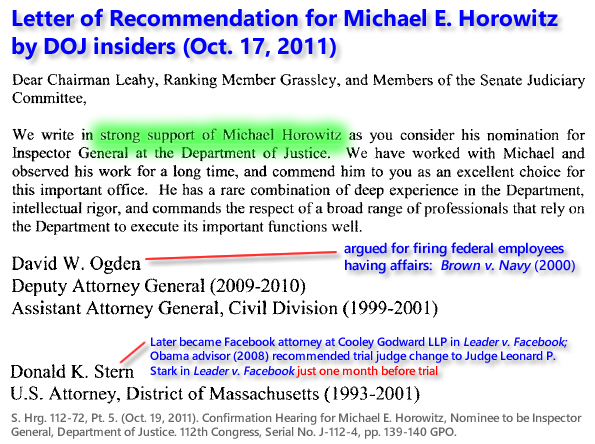 4: Letter of Recommendation for Michael E. Horowitz confirmation (Pages 139-140, 24.1 MB) involving Mueller stooges, includes DOJ insiders implicated in many elements of the Deep State shadow government corruption. Horowitz's association with David W. Ogden proves he knows Peter Strzok and Lisa Page should be FIRED IMMEDIATELY for their affair. Ogden argued for such firings in Brown v. Department of the Navy, 229 F 3d 1356 (Fed. Cir, 2000)(David W. Ogden representing the Navy). Horowitz's association with Donald K. Stern proves a direct connection between the Justice Department and its obstruction of justice with Hillary Clinton and the State Department in Leader v. Facebook.—the theft of Leader's social networking invention. The courts protected Facebook even after Leader proved that Facebook infringements Leader's patent on 11 of 11 claims. Ogden argued successfully for the firing of Marine employee Michael J. Brown who was fired for an affair with a Marine major's wife. This case did not even involve top secret clearances. Brown v. Department of the Navy, 229 F. 3d 1356 (Fed. Cir. 2000). So why haven't Strozok and Page been fired?! In short, Mueller's softball treatment telegraphs that the real purpose for the leak appears to be to protect Strzok and Page. Experts are certain that Mueller is responding lawlessly to the leak and revelations of an affair among senior FBI officials. Fig. 5: Peter P. Strzok, the demoted former chief of FBI counterintelligence hated Donald Trump. He used his powerful position at the FBI to punish Trump supports and cover-up the illegal activities of Hillary, Podesta and Soros backers. Based on the investigation described in this post, Strzok is an evident agent of the Deep Shadow government that is attempting to take over the American Republic. Despite Strzok's seething political bias, Mueller assigned him to the Trump-Russia election meddling investigation anyway. Mueller is either an idiot himself, or calculating, and we don't think he’s an idiot. Later, Strzok edited James Comey’s Hillary Clinton exoneration letter from “gross negligence” (factually illegal) to “extreme carelessness” (not even a legal term). Tellingly, Rosenstein seemed to explain away Strzok's conduct by voicing the excuse that FBI agents are allowed their personal political opinions, and are professional enough to keep them separate from their work. If you believe that personal political opinions don't affect professional actions in this case, then you are the idiots, Messrs. Rosenstein and Strzok. Evidently, you picked each other to run this investigation, out of all the tens of thousands of capable attorneys. Your biases drove your decisions! Any reasonable person can see that clearly. Rosenstein's answer about private political opinions was too quick and rehearsed to be credible. At this stage, he and his cronies have lied so often that we are all wise to them now. Strzok said: "Just went to a southern Virginia Walmart. I could SMELL the Trump support…" By contrast, their stench wraps the planet. For readers unfamiliar with texting shorthand " ;) " is a wink and a smile. Strzok has used his position of public trust to attempt to control American politics and reinforce his job as the chief of counterespionage. Here we have the FBI’s counterespionage chief admitting that the FBI’s “Espionage Machine Party” is the only real power in America. "Espionage Machine Parties" in history had names like The Third Reich, the Soviet Communist Party, The Maoist Party. We have just learned that our long-time FBI Chief of Counterterrorism, Peter Strzok, has been working with Mueller, Rosenstein, Chandler, Comey, Holder, Obama and many others to establish America's secret espionage machine as the controlling political party. Every day we citizens leave these evil people in their positions now, we are the fools. AFI corruption researchers have observed that the more pages a government "finding" generates, the more corrupt the agency. 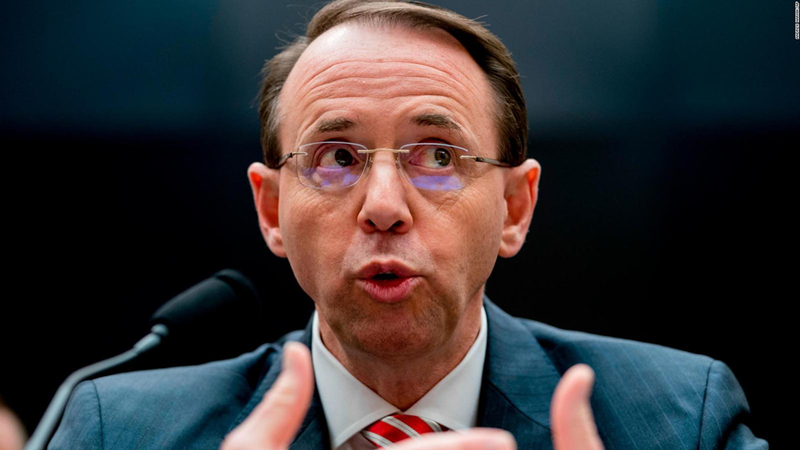 Like Rosenstein’s betrayed body language, his deference to all-things-Horowitz telegraphed that they are going to dump a whopper of meaningless nonsense. We've got your numbers boys and girls. 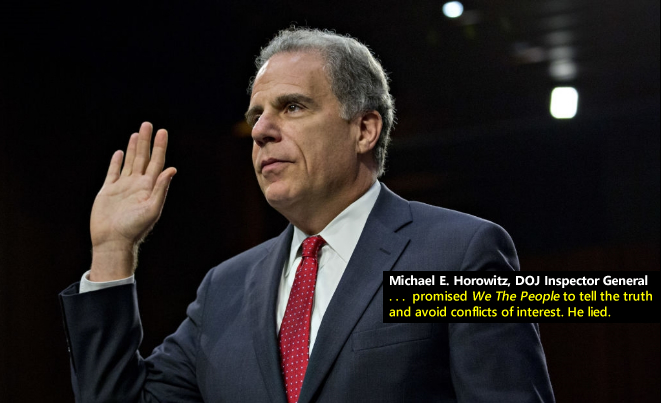 Horowitz certified his commitment to be ethical in his Statement, albeit in a backhanded way that is typical of these Deep State slime ball attorneys. He says he consults with unnamed others. He references an ethics agreement not submitted to the Senate (and can therefore be changed at any time since it does not go into the Senate record). He says he will follow the recommendations of unnamed other ethics people. Again, who can check? Horowitz traveled and worked the following countries during his speaking tours: Russia (2004, Oct.), Moscow, Russia (1998, Jul.) Beijing, China (1999, Sep.), Bangkok, Thailand (2002, Mar. ), Capetown, South Africa (2000, Sep.), Sydney, Australia (2001, Sep.)—talk about potential for collusion! For almost a decade Horowitz engaged in a break-neck speaking schedule around the planet. Ostensibly as a private citizen, he trained judges and lawyers on the subjects of sentencing guidelines, compliance, ethics, Sarbanes-Oxley and liability avoidance. He did this all the while Bill Clinton roamed the planet raising money for The Clinton Foundation and using Secretary of State Hillary and Obama's State Department for pay-to-play. Fig. 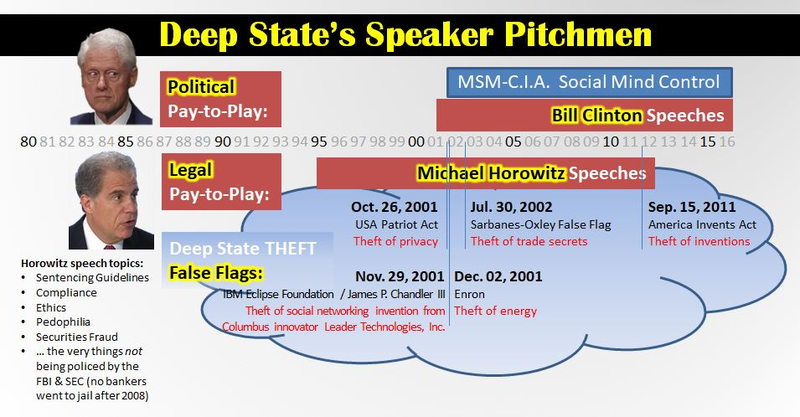 8: Bill J. Clinton and Michael E. Horowitz roamed the world giving political and legal speeches, pollenating political and legal corruption around the planet obviously preparing for the Deep State shadow government to takeover the American Republic. Fig. 9: Davos. (Jan. 29, 2011). Herman Van Rompuy, President of the European Council meets with Bono, George Soros and Rep. Barney Frank. YouTube. World Economic Forum. Raw video (*.mp4). Horowitz’s law firm Cadwalader, Wickersham & Taft LLP has well-known New World Order globalist companies as clients, including Bank of America, Barclays, Deutsche Bank, JP Morgan Chase, Microsoft, Morgan Stanley and Qualcomm. Qualcomm (the primary wireless technology provider that embeds Deep State encryption NSA/C.I.A. backdoors) was a member of Barack Obama’s "Technology CEO Council," and Obama made a special secret visit to Qualcomm in San Diego in Air Force One on Oct. 9, 2017. Fig. 10: On Mar. 02, 2015, President Obama and senior adviser, Valerie Jarrett, met with chief beneficiaries of the stolen Eclipse Foundation code:IBM, Xerox, Dell, Micron Technology, Qualcomm and EMC. Given the timing of this meeting―a week after the radical "Net Neutrality" changes to Internet regulation by the FCC—the real agenda of this group was most likely to discuss progress on their common agenda—the IBM et al "The Internet of Things" takeover of global digital infrastructure, which the FCC changes to Internet regulation helped facilitate. Fig. 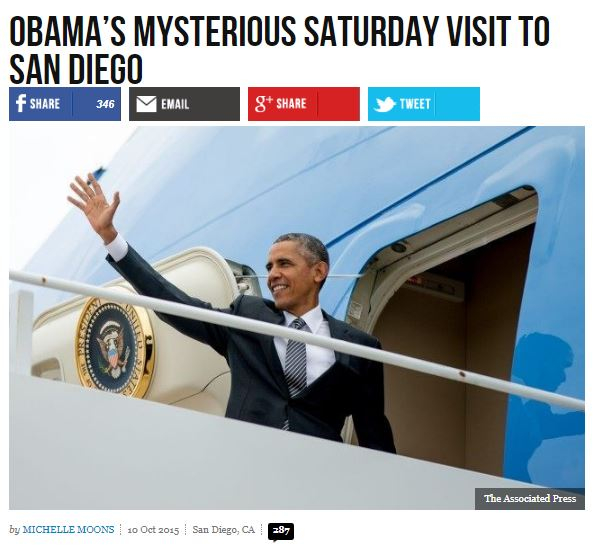 11: On Oct. 10, 2015, President Obama made a "fund raising" trip to visit Qualcomm headquartered in in San Diego, CA—a member of his inner "Technology CEO Council" with other members of the Deep State shadow government's IBM Eclipse Foundation. 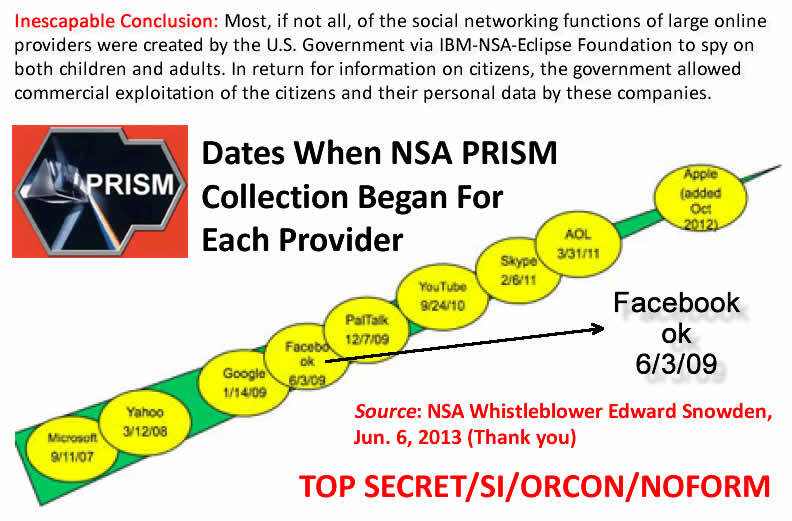 Eclipse distributed the stolen social networking invention of Leader Technologies, Columbus OH and have redeployed it as a weaponized global spy network. Fig. 12: On Jun. 06, 2013, NSA Whistleblower, Edward Snowden, revealed that most large online data services providers participate in an NSA program to sweep up all user data into NSA computers for "Big Data" analysis and data mining. The companies revealed are Microsoft (9/11/07), Yahoo (3/12/08), Google (1/14/09), Facebook (6/3/09), Paltalk (12/7/09), YouTube (9/24/10), Skype (2/6/11), AOL (3/31/11), Apple (added Oct, 2012—one year after Steve Jobs died, replaced by former IBMer Timothy D. Cooke. AT&T also participated. Horowitz's Cadwalader Law other clients including Bank of America, Barclays, Deutsche Bank, JP Morgan Chase and Morgan Stanley were primary underwriters and beneficiaries of the fraudulent Facebook initial public offering on May 18, 2012, among others. 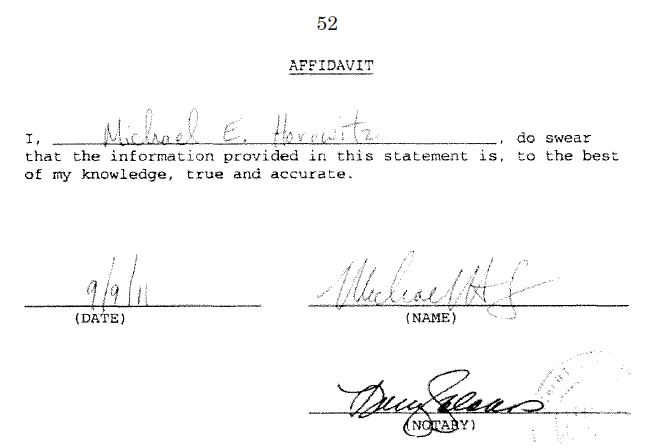 Horowitz declared his net worth at almost $10 million in 2011. Genius or insider trading. See earlier links for Horowitz' Senate Confirmation Hearing testimony. Horowitz’s total lack of impartiality disqualifies him. Michael Horowitz must recuse himself or be fired forthwith from further work on the Trump-Russia investigation. His fraudulent manipulation of the rules by releasing the Strzok-Page texts insured that those two could not be prosecuted for that evidence since any trial would be tainted by Horowitz's own hand. He protected them, which he will continue to do for all his cronies. Ask President Trump to fund the alternative media via Leader Technologies' Miller Act Notice. This would generate $300-500 billion per year in new revenue for the government without raising taxes, so investigations like this can start holding these corrupt public officials accountable in real time—rather than years after their crimes have done their serious damage to our Republic. Fig. 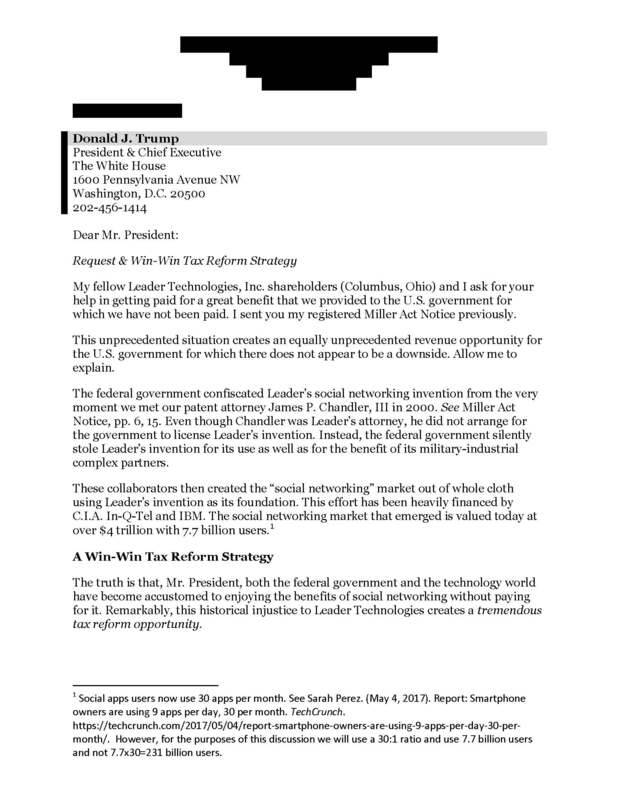 13—Cover letter to President Donald Trump from many hundreds of Leader shareholders across America beginning to send Tier II Miller Act Notices to the White House asking the federal government to finally pay them for using their social networking invention for the last 17 year, since 2000 when Clinton national security advisor James P. Chandler, III first learned of Leader's innovation. See previous post. The Weaponization of Social Media Should Concern Us All. Just when you thought there was hope that IG Horowitz would be a force for the good, we learn this incredible backstory on yet another globalist. It really is up to We The People to force resolution of this amazingly corrupt situation. There is no point in waiting for Horowitz's ridiculous report. Spread the word. Horo-witch is a Soros stooge. This article hints that a plot to end the life of the POTUS exists as an ‘insurance policy’, to use their own words. I have always said that once ‘Communists obtain power’, that they will not relinquish it without force. Removing them does not stop them, ever. This makes it very difficult for good people to defeat such evil. Joe Setyon. (Dec. 15, 2017). Trey Gowdy Predicts New Trump Shakeup. Western Journalism. After FBI Deputy Director Andrew McCabe abruptly canceled his scheduled testimony before the House Intelligence Committee this week, South Carolina Republican Rep. Trey Gowdy made a prediction about McCabe’s future employment status. McCabe was supposed to appear before the committee on Tuesday for a closed-door testimony to answer questions related to Peter Strzok, an FBI official who was removed from special counsel Robert Mueller’s probe into Russian collusion in the 2016 presidential election due to anti-Donald Trump text messages he sent to a colleague. At the last minute, though, McCabe pushed back his testimony. Staff. (Dec. 15, 2017). BREAKING: Comey and McCabe Have Just Been Implicated. Truth Feed News. Strzok is the anti-Trump/Pro-Hillary agent who made “edits” to James Comey exoneration piece in order to help Hillary. Forx example he changed the term “grossly negligent” to “extremely careless” in order to soften the blow and limit the damage to her during the 2016 election. That’s “election interference,” by the way. Turns out he’s not the only one implicated in the coverup scandal. Tom Fitton. (Dec. 3, 2017). NEW DOCUMENTS REVEAL FBI'S CLINTON COVER-UP. Fox News. American Center for Law and Justice says documents show FBI was more focused on keeping the meeting quiet than the meeting itself. Staff. (Dec. 17, 2017). BREAKING From Alabama – Moore Just Uncovered MAJOR Fraud!! !Published on Dec 17, 2017. FreedomDaily. If there’s one thing we learned about the presidential election last year, it’s that liberals will do whatever it takes to win. We constantly heard incidents of voter fraud taking place, where Hillary’s minions were voting multiple times, and buses of people were being be transported into key swing counties in order to throw the vote. As liberals disgustingly throw Doug Jones’ win in our faces this morning, Republican Roy Moore is refusing to concede, after evidence of voter fraud is now being revealed, sure to overshadow the “win” that liberals are calling a “stinging snub” to President Trump. Being able to go back and recount digital votes is a very serious step to preserving the integrity of elections, due to the massive voter fraud that took place by Hillary and her minions throughout the presidential election last year. But yet again, liberals are using their shady judges as the criminal arm of their shady enterprise, where in a shocking eleventh-hour order, the Alabama Supreme Court ruled that counties in Alabama can destroy voting records in the Roy Moore-Doug Jones race, going against the longstanding rule that these counties preserve the records and the integrity of the race. Tom Fitton. (Dec. 18, 2017). JUDICIAL WATCH FILES AMICUS CURIAE BRIEF URGING FEDERAL COURT TO UNSEAL DEPOSITIONS OF IRS OFFICIALS LERNER, PAZ IN TEA PARTY TARGETING. Judicial Watch. Julian Assange. (Dec. 17, 2017). Re: General McCasland. WikiLeaks. He mentioned he's a "skeptic", he's not. I've been working with him for four months. I just got done giving him a four hour presentation on the entire project a few weeks ago. LOL. MUELLER WILL TRY AND STAY AHEAD OF THE BREWING DOJ IG HOROWITZ SCANDAL. Diana Stancy Correll. (Dec. 15, 2017). Robert Mueller to meet with Trump's private lawyers: Report. Washington Examiner. Special counsel Robert Mueller, who is spearheading the federal Russia inquiry, is scheduled to meet with President Trump’s private lawyers as early as next week, according to a new report. Those familiar with the matter are optimistic the meeting has greater significance than previous meetings between the Mueller team and Trump’s lawyers because it follows reports that the probe has finished interviewing White House staff, CNN reported Friday. Mueller’s team has not initiated an interview with Trump or Vice President Mike Pence. Staff. (Dec. 14, 2017). Judicial Watch Sues FBI for Records About Removal of Former Deputy Assistant Director Peter Strzok From Mueller Operation. Judicial Watch. Reposts of this article are EXPLODING!!! Todd Starnes. (Dec. 18, 2017). REP. JIM JORDAN: I'M CONVINCED FBI WAS TRYING TO STOP TRUMP FROM BEING ELECTED. Fox News. Rep. Jim Jordan, R-Ohio, told the Todd Starnes Show he is convinced the FBI was actively trying to stop Donald Trump from being elected president of the United States. Last week, Rep. Matt Gaetz, R-Fla., called for the firing of special counsel Robert Mueller. Spread the word Paul Reveres. The FBI is the enemy. Spread the word about our treasonous former President. knew how much time they had to clean out the house. It would appear that they had brought a truck to empty the house of its contents. Something to consider if you have a GPS - don't put your home address in it. Put a nearby address (like a store or gas station) so you can still find your way home if you need to, but no one else would know where you live if your GPS were stolen. A lady went grocery-shopping at a local mall and left her purse sitting in the children's seat of the cart while she reached something off a shelf/ Wait till you read the WHOLE story! Her wallet was stolen, and she reported it to the store personnel. After returning home, she received a phone call from the Mall Security to say that they had her wallet and that although there was no money in it, it did still hold her personal papers. She immediately went to pick up her wallet, only to be told by Mall Security that they had not called her. By the time she returned home again, her house had been broken into and burglarized. The thieves knew that by calling and saying they were Mall Security, they could lure her out of her house long enough for them to burglarize it. Staff. (Dec. 19, 2017). FLASHBACK: ANTIFA ADMITS TRAIN TRACK SABOTAGE NEAR TACOMA TO ‘STOP FRACKING’ - Antifa behind Tacoma train wreck? Spread the word about this treachery. CITE: Daniel Payne. (Aug. 08, 2016). How The Left Is Weaponizing The American Legal System. The Federalist. The point is not for liberals to “win” any particular lawsuit or legal enforcement so much as it is to use lawsuits and the law as the weapons in and of themselves. The process is the punishment. And in most of these cases the punishment is very severe. That’s the idea. In large part this reflects growing liberal opposition to a pluralistic society: not merely opposition to ideas but rather opposition to ideas about ideas, a strong and deliberate enmity towards intellectual diversity and dissenting thought. … That’s the way America was designed, intentionally and with forethought: to allow for dissent, to foster it, even to encourage it. So the Left is turning to lawfare: a systematic effort to turn the American legal system against liberalism’s political opponents. The point is to take the court system (which is supposed to be a neutral arbiter of justice) and the law itself (which in many cases is ideologically neutral) and convert both into partisan weapons for liberal political advancement. It should cause you no small measure of discomfort to know that the Left has been largely successful in these efforts. Lawfare works. Perry’s life had been ensnared in an expensive, distracting, hassling court case for a year and a half. Republican governors elsewhere were meant to take note of what happens when they draw the ire of liberals and corrupt Democratic officials. Spread the word. Lawyers in American are run amok. President Donald Trump's "America First" strategy, detailed in a speech Monday, featured strong words about China and Russia, countries that the president described as "rival powers" to the U.S. But despite Trump's stated goal of building "a great partnership with them," both countries seemed less than enthusiastic about the plan in responses issued Tuesday. Staff. (Dec. 18, 2017). Remarks by President Trump on the Administration’s National Security Strategy. White House.
" . . .It calls for cutting taxes and rolling back unnecessary regulations. It calls for trade based on the principles of fairness and reciprocity. It calls for firm action against unfair trade practices and intellectual property theft. And it calls for new steps to protect our national security industrial and innovation base. . . "
This article on Horowitz is depressing, as so many people pin their hopes on this person to back up Trump, when in fact he is simply another cut-out layer embedded like a Lime’s diseased tick, infesting its host with an disease almost impossible to diagnose or cure. Joshua Caplan. (Dec. 17, 2017)., “ABSOLUTE RED LINE”: Eric Holder Issues Second Warning Against POTUS Trump Firing Mueller. Gateway Pundit. Former Obama-era Attorney General Eric Holder called for mass protests if President Trump fires special counsel Robert Mueller. This is the second warning Holder has issued this week in respect to rumors about President Trump relieving Mueller of his duties as special counsel. As previously reported, Holder threatened Republicans against removing Mueller a day after House members grilled Deputy Attorney General Rod Rosenstein over the special counsel stacking his team with investigators with links to Hillary Clinton. Holder issued his threat in a tweet Wednesday morning. Sundance. (Dec. 18, 2017). FBI Damage Control and Justification Part II – CoIntel Agent Peter Strzok’s Turn…. Conservative Tree House. The previous effort at justification and damage control over the FBI counterintelligence operation to spy on presidential candidate Donald Trump was likely courtesy of FBI Asst. Director of Counterintelligence E.W. “Bill” Priestap. WASHINGTON DC – An FBI agent’s text message that referred to “an insurance policy” and has been cited as evidence of bias against President Trump reportedly alluded to the investigation into Russia’s election interference and any potential ties between Trump’s campaign and Moscow. Spread the world about Priestap, Peter Strzok's FBI bosess of counterintelligence. Investigative Bureau. (Dec. 18, 2017). TRUMP DOSSIER AUTHOR CHRISTOPHER STEELE WORKED WITH FBI'S MCCABE & DOJ'S OHR ON RUSSIAN ORGANIZED CRIME LONG BEFORE 2016 ELECTION. True Pundit. Spread the word. The FBI counter espionage unit is the secret opposition party in America. The DNC and RNC are merely whitewash to fool the masses. THIS IS A MUST READ (AND UNDERSTAND) IN ORDER TO FIGHT AND DESTROY. IT IS KILLING OUR REPUBLIC. Anonymous Patriots. (Dec. 19, 2017). BIG BROTHER IS WATCHING YOU - FOR REAL. American Intelligence Media. Educate the citizenry. Barbarians have seized Washington, D.C.
Dec. 20, 2017—Rep. Jim Jordan (OH-4th) says it appears there was an orchestrated plan within the DOJ and FBI to prevent President Trump from becoming President. These people were all nurtured by a secret corporate combine that has been literally sucking the life out of American creativity. These rogue C.I.A. mind control programs were implemented through the mainstream media decades ago. Skeptical? Read this bombshell exposé : Big Brother is Watching You – For Real (American Intelligence Media). What’s wrong with mind control? Besides the fact that it is inhuman and immoral? It is also illegal. It violates The Hatch Act because federal employees are forbidden from using public funds to promote private political views. This should be a bipartisan concern. These people evidently thought they would never get caught. Modern day Paul Reveres must demand accountability. Now. Lt. Gen. Mihai Pacepa. (Dec. 21, 2017). THE REAL RUSSIAN COLLUSION - Ex-Soviet-bloc spy-chief tell how 'MSM' have become bona fide disinformation tool.. WND. Is Schmidt Leaving Alphabet/Google Because He has Been Caught in Election Rigging, Womanizing Scandal, or What? Spread the word, modern day Paul Reveres.